Today Meg finished packing her things for girls camp. She is leaving tomorrow. She will be gone for the entire week. What will we do without her? How much quieter will it be? What kind of fun will we have without her? Oh, the possibilities. 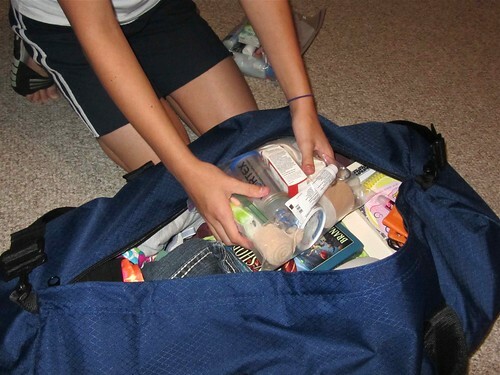 When she started packing she had this large duffle bag, two backpacks, a sleeping bag, and a folding chair. She was instructed to pack light. That's not very light. Mickey suggested that she ask me for help with her packing. I came to the rescue and got rid of one backpack (in fact it's folded up in the duffle in case she needs a light everyday/everywhere bag) and there was still room in the remaining backpack as well as the duffle. I tried fitting the chair in the duffle but it was too long. Darn it. You should have seen how we packed her snacks. We had a square lock-and-lock and inside it we fit 8 granola bars, 8 fruit bars, 3 cliff bars, 3 packs of Pop Tarts, a bag of Jolly Ranchers, and I'm sure there was something else in there too. It's amazing how many snacks you can squeeze in when you take them out of their boxes.